A Season for Red, Green and Black! 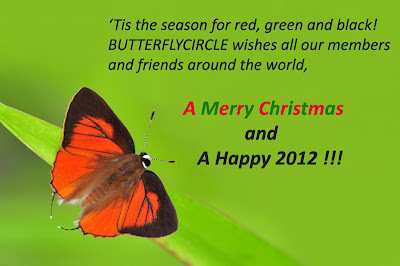 ButterflyCircle Wishes One and All a Merry Christmas and a Happy 2012! It's the Chrismas and the holiday season again. As people from all over the world are preparing for a nice sumptuous dinner, merry-making and spending time with family and friends on Christmas Eve, let's remember to spread a little cheer and love to those who are less privileged or alone. On the personal front, it has been an extremely busy and challenging year, as my company prepares for an exciting future ahead with a new shareholder. 2011 has been a year of new experiences - both happy and sad, where I bade farewell to long-time colleagues and welcomed new ones. The year ahead will be fraught with challenges and new relationships, but one which I look forward optimistically to. It will be a time for great change and many personal quests. I am also glad that ButterflyCircle has had many new and capable members joining us and taking the high-quality photography and research work to newer heights. The spirit of sharing and camaraderie has never been stronger, and we even have active and knowledgeable junior and senior members coming on board with us. We look forward to many new discoveries for Singapore in 2012, many of which are already under preparation for addition to the Singapore checklist after final scientific validation by a few experts. I am optimistic that the Singapore butterfly checklist will reach 310 species by the end of the new year! ButteflyCircle would like to take this opportunity to wish all our members and friends from around the world a Merry Christmas and a Happy 2012! May our Beloved Flying Jewels continue to survive and thrive on our lil' island in the sun! Note on Photo : A shot of Singapore's little 'red spitfire', the Common Red Flash (Rapala iarbus iarbus) sunbathing on a blade of grass in the nature reserves. The little fast-flying butterfly is very local in distribution but can be common in the special locations where they are found. Males tend to dog-fight in the late hours of the day and stop with their wings spread open as in the photo, showing their attractive crimson uppersides.